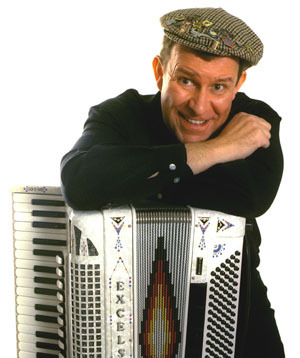 The best way to classify Nigel's stage routine is variety, and whilst Nigel is an accomplished piano accordionist, singer and songwriter by profession, he is also a natural comedian, using daft poetry, hilarious stories and his uncanny ability for acting the fool on stage to get a laugh. His 'country boy' style of presentation adds an extra twist to his performance that has his audience in stitches, yet at the same time offends no-one. Starring in hundreds of Professional Theatre productions every year, Nigel has developed the knack of winding up his audience before delivering the punch line with his trademark wicked grin; a guaranteed way to draw at least a smile even from the most serious minded member of an audience. His musical repertoire embraces a wide variety of genres from country music to favourites from stage and screen. Nigel's most popular work is of course his self penned material, most of which is just simply funny. During the past twenty-five years Nigel has risen to fame using his own unique blend of humour and song, and through appearances on Radio and Television, he has won the hearts of audiences nationwide. It is said that 'Variety is the spice of life that gives it all its flavour,' and if this is the case, then here you have it in one neat package labelled 'Nigel 'Boy' Syer'. Paul and Tony are the Black Country Boys. Their style of comedy and singing ability makes them the West Midlands most sought after duo. Blue Bros, Dean Martin, Frank Sinatra, Take That, Renee and Renato, with Comedy Tribute to Freddie Starr plus many more. This leads to a breath taking tribute to Freddy Mercury featuring the greatest hits of the rock legend.